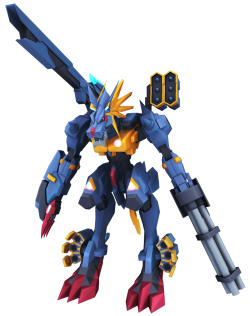 MetalGarurumon X an altered version of MetalGarurumon that carries the X-Antibody Factor : MetalGarurumon in its Digicore. Additional armaments and enhancements to its Kype sensors have been confirmed. Having transformed its entire body into versatile weaponry, its overwhelming firepower can snipe foes at long range, bombard them at mid-range, or use its rapid-fire gatling gun to unleash a Metal Storm at close range. Grace Cross Freezer. Ice attribute 5 seconds cooldown 88 DS consumed 2 skill points per upgrade Learned at Lv. Shoots blue ray that instantly freeze anything in its vicinity. Cocytus Breath. Ice attribute 8 seconds cooldown 196 DS consumed 3 skill points per upgrade Learned at Lv. Launches ice cannon that can freeze anything. Garuru Burst Ice attribute 10 seconds cooldown 230 DS consumed 3 skill points per upgrade Learned at Lv. Fires all weapons armed through the body at once.